Everything was going great, until someone decided to test out their loaded dice. In this compendium, you will find mini-games for players to partake in when they are hanging out at their local watering hole. These games can be casual pass-time for the adventurers while they are waiting to get paid for a bounty, or it can be a high stakes game of chance with a potential pay-out of massive amounts of gold. Some of the games will be familiar to players, while others will be new additions to the game. This game of cards had its origin in heavily mountainous regions, but it has spread to be popular among many different peoples and societies. Betting: This game is most often played against the house, but can also be played in groups. The house has set a minimum buy-in, which varies depending on the establishment. Before any cards are drawn, the players must pay the buy-in. After the buy-in has been paid, the house rolls 2d8 and shows the result to the players. The players can now bet money up to a maximum of triple the buy-in. After betting, they draw one card, represented by rolling 1d8. If the number on their die falls between the two numbers rolled by the house, the player gets the double of their total bet, including the initial buy-in. If they fail or the house-rolled dice are the same or has no numbers between them (such as 4 and 5), the player loses. 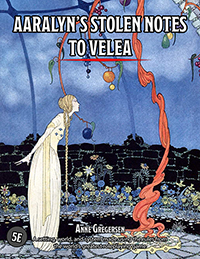 AARALYN'S STOLEN NOTES TO VELEA is a complete campaign setting with a unique world and universe, including 23 subclasses, 5 new races, 2 new subraces, 7 new backgrounds, and much more. Check it out now on DriveThruRPG! This title was added to our catalog on November 30, 2018.